Awareness is level of consciousness, which some can turn on and off, depending on the situation. When you walk down the street, to walk your dog for example, you have two different choices to make. You may choose to walk your dog down the street, hold your head down, and mind your own business. Alternatively, you may wave, ask people how their day is going, and make small conversation, thus having an active awareness of others around you. Imagine this is your daily routine while walking your dog, and your neighbor is always there to greet you back. Now imagine one day, your neighbor is not there to greet you back. You may think nothing of it; possibly they had other obligations at that time. A week has passed. You are realizing other neighbors are vanishing as well. They all have something in common… they are Jewish. You have heard rumors throughout the town, whispers of Hitler’s army and their “Final Solution”. You notice more and more people throughout the town vanishing. Butchers, businessmen, and teachers. You may have noticed, but are you truly aware? 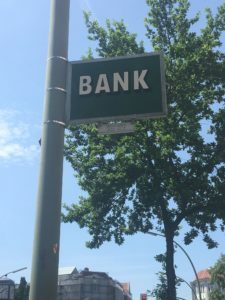 These placards, especially to those who do not live in the neighborhood, blend into the scenery and look like any regular street sign informing, for example, of the location nearby of an actual bank. Another feature is that the texts of the laws of the Nazi era are written in the present tense. I believe both features are incredibly important aspects of this memorial. The fact that these signs are more discreet than most memorials shows how you must be truly aware of both your surroundings and the situation you are in. The present tense in the text, I believe, intends to give the reader a sense of immediacy and an awareness that these laws are not a thing of the very distant past, and reminds citizens of what could happen in the future if action is not taken. This is not a memorial you can just stand in front of, read a plaque, and believe you understand it. You must engage with this memorial and continue your search for knowledge in order to get the full experience. 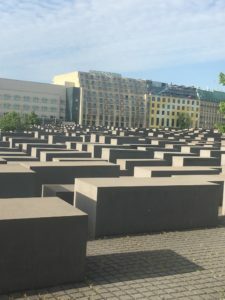 A second monument we visited is titled the “Memorial to the Murdered Jews of Europe”. Consisting of 2,711 grey slabs dispersed throughout a massive area, walking through the memorial, the ground is uneven, given visitors a sense that the slabs are suddenly towering above them. I did not see any signs or explanation of this memorial. If you are unaware of the memorial you may just think this is an expansive modern art installation. 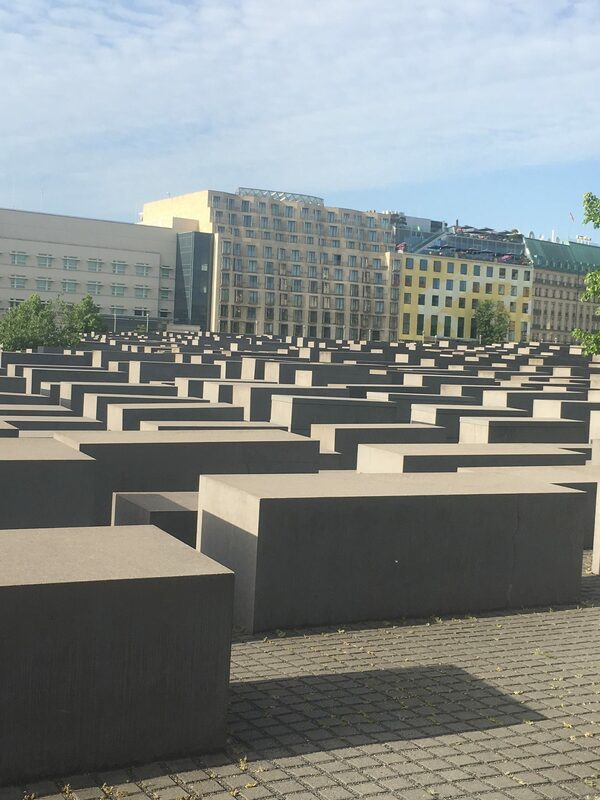 While a sign was lacking, I did see many people sitting on top of the memorial, others taking selfies while moving through the maze of slabs, and a couple caught in a wildly inappropriate act given the importance of the space. Did they know where they were having such an intimate moment? Or what the stone they were sitting on symbolized? I do not know which is a worse answer; not knowing or not caring. 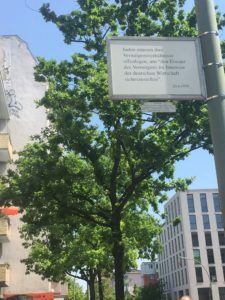 This memorial has received a lot of criticism due to its simple nature and the fact that there is not a large sign stating exactly what the title is and what it is for. Even the title itself has received criticism for its vagueness. It leads you to ask yourself who murdered these Jews in Europe? When? How? I believe the overall vagueness of this memorial is entirely intentional and, to me, part of the beauty of it. You see this vast ocean of grey slabs and you think, why is this here? This is the first level of awareness. You try to find a plaque explaining it, and you find the vague title inscribed on it. This raises your curiosity and makes you think. 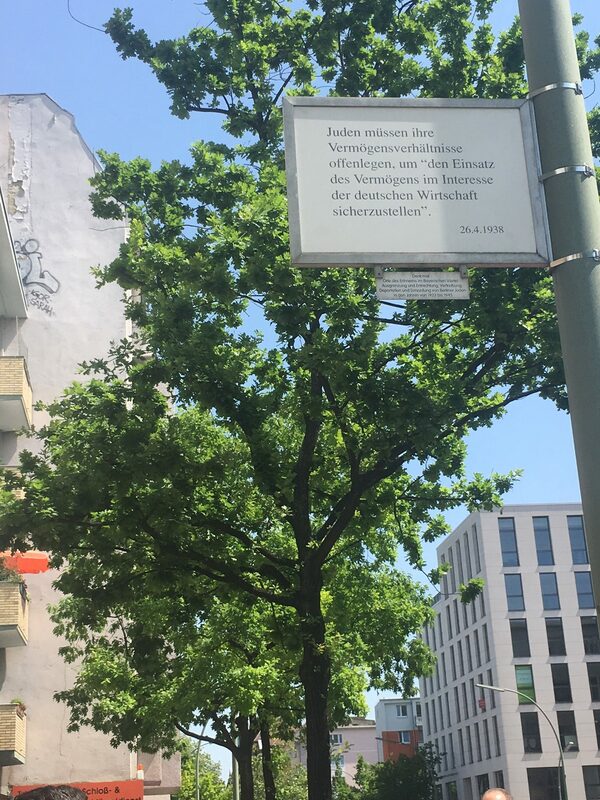 I believe this is the intention of the memorial, to force you to do some research and realize what the memorial commemorates and why it is placed here. This memorial is a true tribute to keeping a memory alive and noticing your surroundings. Every day we choose our levels of awareness. We can either choose to say hello to that neighbor or not. We can choose to turn on the news and do our own research further, or not. We, as citizens, need to be aware of those around us, in particular paying attention to human rights violations happening every single day all around us, even in our own neighborhoods. When you are taking that walk down the street with an increased awareness you may see things you never even noticed before. These memorials serve as a testament, and a warning, to be aware.